All the stars, the winners, the glamour and the glitz from the red carpet at this year's BAFTA Film Awards - check out our pictures! 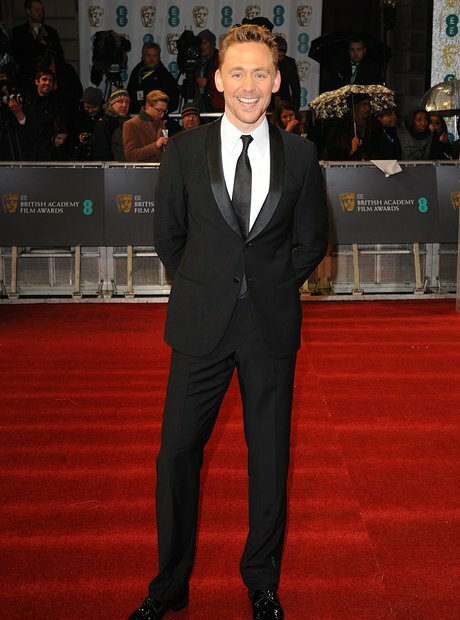 Avengers and Thor actor Tom Hiddleston arriving for the 2013 British Academy Film Awards at the Royal Opera House. Best actress nominee Jessica Chastain arriving for the 2013 British Academy Film Awards at the Royal Opera House. Actress Juno Temple arriving for the 2013 British Academy Film Awards at the Royal Opera House. St. Trinian's and James Bond actress Gemma Arterton arriving for the 2013 British Academy Film Awards at the Royal Opera House. Lincoln actor and best actor nominee Daniel Day-Lewis arriving for the 2013 British Academy Film Awards. Django Unchained star Samuel L. Jackson arrives at the BAFTAs. Comedian Jack Whitehall and Gemma Chan arriving for the 2013 British Academy Film Awards at the Royal Opera House. Les Misérables star Helena Bonham Carter and her director husband Tim Burton arriving for the 2013 British Academy Film Awards. No empty chairs or empty tables for Eddie Redmayne, arriving for the 2013 British Academy Film Awards at the Royal Opera House. David Morrissey, Thomas Newman and Paloma Faith in the press room at the 2013 British Academy Film Awards at the Royal Opera House - Newman was the winner of the Best Original Music award for Skyfall. Star Trek actor Simon Pegg arriving for the 2013 British Academy Film Awards. Life Of Pi director and nominee for best director Ang Lee arriving for the 2013 British Academy Film Awards. Skyfall villain Javier Bardem stalks the red carpet at the BAFTAs. Best Supporting Actress for her role in Les Mis, Anne Hathaway arrives for the 2013 British Academy Film Awards. Paloma Faith opened the BAFTAs with a stirring performance, and her striking frock lit up the red carpet. Helen Mirren gives a twirl for the cameras at the 2013 British Academy Film Awards. Argo director Ben Affleck arriving for the 2013 British Academy Film Awards. Daniel Day-Lewis arriving for the 2013 British Academy Film Awards at the Royal Opera House. Star of The Master Joaquin Phoenix arriving for the 2013 British Academy Film Awards. Sally Field keeping dry for the 2013 British Academy Film Awards. Anne Hathaway with the award for Best Supporting Actress (and her fringe) for Les Misérables. Christoph Waltz with (or behind) the award for Best Supporting Actor for Django Unchained in the press room at the 2013 British Academy Film Awards. Danny Boyle and Tessa Ross in the press room at the 2013 British Academy Film Awards at the Royal Opera House. Daniel Day-Lewis with the award for Best Leading Actor for Lincoln. Ben Affleck with the award for Best Film for Argo in the press room at the 2013 British Academy Film Awards at the Royal Opera House. Affleck also scooped the BAFTA for Best Director, too - what a night for him. Juno Temple with her Rising Star BAFTA in the press room at the 2013 British Academy Film Awards. George Clooney, Grant Heslov, Samuel L Jackson and Ben Affleck in the press room at the 2013 British Academy Film Awards - quite a line-up. They were all there to celebrate the triumph of Argo, named best picture. A lightly dishevelled Quentin Tarantino with the award for Best Original Screenplay for his movie Django Unchained. Lightly flecked with snow, director Tom Hooper arrives for the BAFTAs, where his movie Les Misérables is up for several awards. Skyfall actor and James Bond stalwart Dame Judi Dench arrives at the EE British Academy Film Awards at the Royal Opera House. Django Unchained actor Samuel L. Jackson hugs Les Misérables director Tom Hooper at the 2013 British Academy Film Awards. Winners Robert Wade, Sam Mendes, Barbara Broccoli, Michael G Wilson and Neal Purvis with the award for Outstanding British Film for Skyfall in the press room at the 2013 British Academy Film Awards. Ang Lee with the award for Best Cinematography for Life of Pi which he accepted on behalf of Claudio Miranda in the press room at the BAFTAs.